In anticipation of the second LTRO program from the ECB, Barclays Capital has revised its expectation of the Eurozone's "Surplus Liquidity" measure. Surplus Liquidity represents bank Excess Reserves (in the reserve account) plus the amount in the Deposit Facility; basically the amount available for lending/investing to the banking sector. Expressed another way, Surplus Liquidity is roughly equal to the total amount of euros in the euro-system less bank reserve requirements less government deposits directly at national central banks less physical notes in circulation. Since LTRO-II is expected to introduce incremental semi-permanent liquidity into the system, the amount of Surplus Liquidity will go up accordingly. As much as the ECB does not want this program to be viewed as a form of QE, it actually is. The difference between this process and the Fed's program is that LTRO is locked up for three years (although banks can repay it after one year), while the Fed can start taking liquidity out at any time (the ECB can reduce balance sheet as well by selling other assets.) LTRO is also meant to support banks directly, while Fed's QE is a general expansion of base money. The new 3-year LTRO will be allocated on Feb 29th. Barclays expects the take-up to be €250bn-350bn (closer to the upper end of the range). The actual size may depend on the types of collateral that will be eligible. Some third of the LTRO-II will be used to refinance existing short-term ECB loans. Another third will be used to cover maturing bank bonds, particularly the unsecured paper that has no natural buyers. 1. 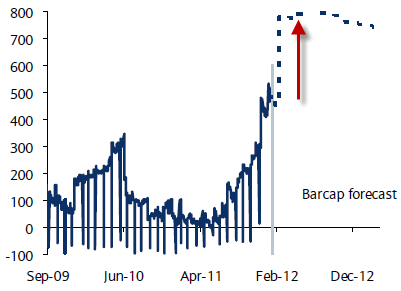 We should see a spike in the ECB Deposit Facility comparable to the increase in the Liquidity Surplus (chart above). 2. This will further reduce private repo financing in the banking system, driving down M3, the broad money stock indicator, particularly in the periphery countries. 3. LTRO-II will create additional encumbrance of bank assets pledged as collateral to the ECB, making any unsecured bank paper even less likely to recover anything in default. 4. The ECB will be less willing to lower rates further until it sees the full impact of this program. The central bank wants to leave some tools in its "monetary toolbox", should the situation in the Eurozone suddenly take a turn for the worse. For further information on the LTRO program, please see this description/manual called THE LONGER TERM REFINANCING OPERATIONS OF THE ECB.